What Is Mentalligence, and How Can It Help Me? Mentalligence will help you rethink your way to the good life. Mentalligence (pronounced “MEN-tell-a-jence”) is a new psychology of thinking model that launches us into UPward spirals through a process of Unlearning and Pivoting away from indoctrination that damages human progress. We then become more agile, mindful, and connected thinkers who bring social impact. Mentalligence helps us rethink our way to the real good life, not the one that’s being sold writ large. You’ve probably already noticed that mentalligence is a fusion of the words mental and intelligence. It might remind you of the term emotional intelligence, coined by Daniel Goleman. As you’ll soon see, many popular terms and theories need some rethinking. Mentalligence helps you rethink your way to the good life. It’s a pretty tall order, but worth the investment. Throughout this book, you will learn how to unlearn and pivot, or “spiral UP,” through four sets of sessions that teach how to use specific lenses to help undo damaging indoctrination. You’ll get the backstory of how these lenses emerged from my research findings, clinical practice, and the latest neuroscience. Certain key words and concepts can change the way you engage with the world: agile, mentally intelligent, forever learner, ethics of reciprocity mind-set, impact-driven living, imposter syndrome, and collective efficacy. Academic and more common definitions throughout will help you put your learning into action. 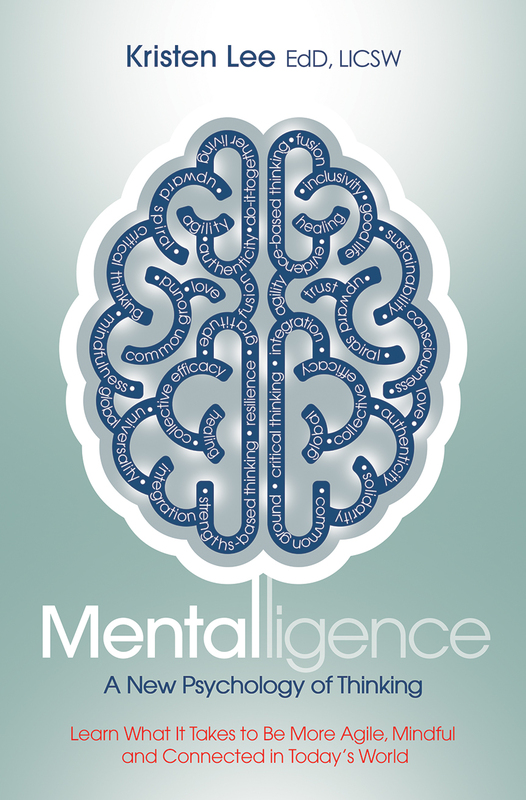 For now, here’s the short list of the driving principles behind Mentalligence. Since the beginning of time, being strong has been hyped up. Despite the overemphasis on mental strength, IQ, and bootstrapping, agility is what really matters. With change as life’s only constant, it isn’t brute force, will, or sheer genius, but the ability to pivot and adapt to life’s twists that make us mentally intelligent. Everything is learning, learning is everything. The desire to be right can trip us up. None of us have all the answers; everything has contradictions. When we commit to becoming forever learners, we seek opportunities for constant growth and discovery, not alleged certainty or fake truth. We unleash creativity and curiosity, finding out just how many lenses are available to help us see better. The true marker of learning is turning up more questions than answers. Sleepwalking through life is a waste. We can’t afford to snuggle up with blind comfort and compliance. We need a dose of smelling salts to awaken us to the possibility of finding the path to the good life as conscious, reflective thinkers who refuse to approach life with eyes closed. None of us want to experience regret, but a lack of thinking and the resulting behaviors can leave us stewing in it, if we don’t pay attention. Ethics of reciprocity mind-sets, those focused on the Golden Rule, can help us upgrade individual purpose to impact-driven living. Check your pretenses. “Control” and “neat” are illusions. None of us can hold it together every second. We’re always spiraling up and down. Chaos and homeostasis are always at odds. Life isn’t linear; it might be a little boring if it were. Spirals are everywhere in nature—sunflowers, galaxies, our fingerprints, ears, thoughts, and even our behavioral patterns. Your wrinkles, bumps, and bruises show the world you are truly a force of nature. Messy is authentic—and orderly in its own unique way. Being judgmental leads to trouble. When we’re our own worst critics, we bind up and fall prey to imposter syndrome. Perfectionistic thoughts hold us hostage and are the birthplace of self-loathing. We salivate at the thought of becoming a better version of ourselves but don’t stop to celebrate who we are now. The airbrushed you always wants to make a return. We downgrade ourselves, thinking we’re imposters about to be exposed. Self-compassion needs to be a daily practice to fight off ASSIE tendencies, so that we can have an integrated view of ourselves based on our mindful presence, not a performance. The greatest gift we can give to ourselves and one another is to be open to rethinking and unlearning what we first believed. Some call this flip-flopping; my research shows that mental flexibility is a key to progress. When we avoid succumbing to blind spots that impede our ability to see beyond primitive instincts, indoctrination, hierarchies, and social pressures, we can strip down and rebuild in ways beyond our imagination. We don’t have to subscribe to myopic ways of seeing the world. Centric beliefs and behaviors hinder progress. We need to stop bickering about who’s the boss and instead find spaces for all voices to contribute. When we unbind ourselves from prescriptive formulas and egocentric tendencies, we find intersections where we can break new ground to accelerate progress. Cliques, silos, and the ignorance they breed bring us all down. Fusion is the gateway to collective efficacy, one of the key findings from my research: the idea that we do well when we all do well. These guiding principles of mentalligence help us avoid the four most common mindless behavioral traps: shutting down, numbing out, binding up, and staying stuck. These traps, caused by sleepwalking, perfectionism, groupthink, and stagnation blind spots, don’t have to trip us up indefinitely. There’s a way to see beyond them. Through a process of behavioral change, mentalligence teaches you to drive your brain through a series of waking up, tuning in, breaking out, and going beyond sessions. You will develop reflective, mindful, universal, and imagineering lenses to overcome blind spots caused by indoctrination and primitive instincts, and you will learn to Spiral UP (unlearn and pivot). When we approach life with this new psychology of thinking, we awaken to endless possibilities for growth and progress. We build meta-awareness, the capacity to think about thinking. This helps us deliberately refine behavior, moving toward better cognitive habits, skills, and mind-sets that support individual and collective success. Sleepwalkers to reflectors—those who are meta-aware and able to actively improve life for themselves and others. Perfectionists to mindful thinkers—those who are self-compassionate and value presence over performance. Centrists to conscious contributors—those who work toward the good life by connecting and contributing as universal, global citizens. Stagnates to imagineers—those who defy convention and beat the odds by imaginatively engineering a path for better living. Mentalligence helps us use new lenses to reduce blind spots based on raw, fear-based emotions, groupthink, bias, and the breakneck speed we contend with. We learn to be open, agile thinkers, and ultimately wield our greatest resource—our capacity to use our minds purposively to contribute as awake, tuned in, connected, imaginative citizens. These sessions didn’t appear in the air out of sheer magic. They emerged from over twenty-two years of working with thousands of patients and students who were trying to undo their own types of indoctrination. As the book unfolds, I’ll share their stories with you to help you rethink your own. Waking Up is our strength. Tuning In is our way back to center. Breaking Out is our birthright. Going Beyond is our dance. Dr. Kristen Lee, author of Mentalligence, is a recognized, award-winning clinician, author and Behavioral Science professor from Boston with more than twenty years in the field. Her work has been featured on NPR and CBS radio. Dr. Lee has a robust platform—she speaks across the U.S. and around the globe with business leaders, educators, physical and mental health professionals and general audiences. Some of the venues she speaks at include Harvard University, Ted X, Virgin Pulse, and Johnson & Johnson.